The Sinfonia Concertante for Violin, Viola and Orchestra in E-flat major, K. 364 (320d), was written by Wolfgang Amadeus Mozart. 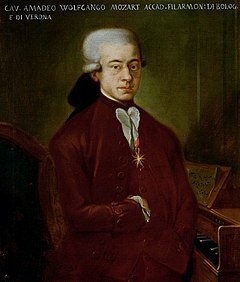 At the time of its composition in 1779, Mozart was on a tour of Europe that included Mannheim and Paris. Mozart had been experimenting with the sinfonia concertante genre and this work can be considered his most successful realization in this cross-over genre between symphony and concerto. The piece is scored in three movements for solo violin, solo viola, two oboes, two horns, and strings, the latter including a divided viola section, which accounts for the work's rich harmony. The solo viola part is written in D major instead of E flat major,[a] and the instrument tuned a semitone sharper (scordatura technique), to give a more brilliant tone. This technique is uncommon when performed on the modern viola and is used mostly in performance on original instruments. Richard Wigmore in Gramophone October 2015 says there are over 40 CD recordings, of which 20 are listed. He rates as best to date one by Iona Brown, violinist and conductor, and Lars Anders Tomter, viola, with the Norwegian Chamber Orchestra, Chandos CHAN9695. Also on his "short list" is a 1989 recording, with Iona Brown, and with Nobuko Imai, viola. This Sinfonia Concertante has influenced many arrangers to use its themes. In 1808 an uncredited arrangement of the piece for string sextet Grande Sestetto Concertante was published by Sigmund Anton Steiner. All six parts are divided equally among the six players; it is not presented as soloists with accompaniment. It has also been arranged for cello in place of the viola part. The Sinfonia Concertante was mentioned in William Styron's 1979 novel Sophie's Choice; after a stranger molests Sophie on the subway, she hears the Sinfonia Concertante on the radio, which brings back memories of her childhood in Kraków and snaps her out of her depression. Variations on the slow second movement were used for the soundtrack to the 1988 Peter Greenaway film Drowning by Numbers by composer Michael Nyman. The original piece is also heard after each of the drownings in the screenplay. The American composer and bassist Edgar Meyer was so interested in this work that in 1995 he wrote a double concerto for double bass, cello and orchestra that, while very different in style, closely mirrors the structure of Mozart's Sinfonia concertante. The andante movement of this piece was featured in Nuri Bilge Ceylan's 2002 film Uzak. The first movement of the piece was briefly heard in the 1984 movie "Amadeus". Mordden, Ethan. A Guide To Orchestral Music: A Handbook for Non-Musicians (Oxford, 1980). "Mozart:Sinfonia Concertante for violin, viola and orchestra". Viola in Music. 2012. Retrieved 1 July 2013. Anderson, Keith (1990). "Liner Notes - Mozart: Violin Concerto No. 4 / Sinfonia Concertante, Naxos 8.550332". Naxos. Retrieved 1 July 2013. Filmer, Andrew. "Mozart: Sinfonia Concertante in E flat major for Violin, Viola and Orchestra". Andrew Filmers Blog. Retrieved 1 July 2013. Freed, Richard (2005). "Program Notes - Sinfonia concertante K. 364". The Kennedy Center. Retrieved 1 July 2013. Freiberg, Sarah (2007). "'Mozart: Grande Sestetto Concertante for String Sextet after the Sinfonia Concertante, K.364,' Edited by Christopher Hogwood". StringsMagazine.com. Retrieved 1 July 2013. Heninger, Barbara; Kujawksy, Eric (2004). "Wolfgang Amadeus Mozart - Sinfonia Concertante". Redwood Symphony. Retrieved 1 July 2013. Nemet, Mary (2009). "'Grande Sestetto Concertante (1808) After the Sinfonia Concertante, K. 364,' by W.A. Mozart". StringsMagazine.com. Retrieved 1 July 2013. Pajot, Dennis. "K364 Sinfonia Concertante in Eb for Violin and Viola". MozartForum.com. Retrieved 1 July 2013. This page was last edited on 13 July 2018, at 05:21 (UTC).